We are proud to announce a publication of an exclusive interview with our leading professional Alex Shekhtman. 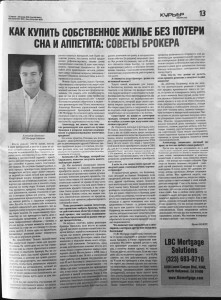 Last week a local Russian news paper “Kurier” has published a new how-to guide dedicated to helping home buyers. This guide will also have information useful to anybody who is interested in refinancing their existing loan.